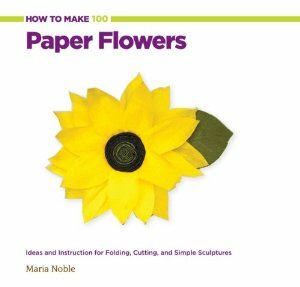 Maria Noble is an enthusiastic artist who wrote this book to share with people the art of making paper flowers. It's 100 projects shown with color photos and with the templates you'll need to create the blossoms shown. It's spiral bound in a hard cover to lay flat while you're working on a project from this book. It starts with an explanation of the tools and materials you'll need to create the flowers, explaining the different kinds of paper, what florist tape and how it works, and other information you'll need. It also offers suggestions for where to buy the materials. Then it gets into the projects. The first section is the one that a lot of people will find the most inspiring. Realistic flowers made from good quality crepe paper. It's also the most extensive section in the book. The flowers in this section would work well for creating paper fashion accessories such as a straw hat decorated with flowers for a Derby party, or gorgeous decorative accents for a home or an occasion. My favorite thing in this section is the fact that it has 10 of the 12 birth month flowers! So you could pair a pretty vase with a handmade paper flower as a birthday gift. After that, is less realistic flowers made from a variety of materials such as newsprint, construction paper, cupcake wrappers and tissue paper. These are the flowers that will look fantastic in paper craft applications like shadow boxes, book covers, fanciful gift wrapping and dimensional cards. My favorite in this section is the black and white newsprint poppy and on the facing page, the brightly colored, loopy and easy to make Fiesta Flower. The fiesta flower is one that could be made as a project with children then hung on thread to create a fantastic spring decoration, or made small as a decoration on a gift or card. Then comes origami flowers- these don't follow standard origami instruction diagrams. They are explained in text with photos to show how to fold them. There are some modular flowers in this chapter as well. My favorite is the Kusudama flower. After that, quilled flowers! Quilling is such a great look, and the simple flowers shown are a great introduction to the craft. My favorite project in this section is a toss up between the intricate filigree effect of the quilled bouquet which would look wonderful framed as art or the dandelions because I love dandelions so much. At the end of the book are the templates for the various flowers, and a resource guide with places to buy materials online. The projects are simple and look really beautiful. To see one a project by Maria Noble, check out this one for whimsical poppies.